UPDATED – ALBANY, N.Y. (CNS) — Among the 20 people killed in a devastating limousine accident Oct. 6 in Schoharie were several victims who had connections to parishes, schools and Catholic organizations of the Albany Diocese. All 17 passengers in the limo and its driver were killed when the car ran through a stop sign, struck two pedestrians and a parked car, and landed in a shallow ravine. The pedestrians also died. Police have arrested the owner of the limousine company and charged him with criminally negligent homicide. Among the fatalities was Amanda Halse, 26, a server, bartender and supervisor at the restaurant at Shaker Pointe senior living community in Watervliet, sponsored by the Sisters of St. Joseph of Carondelet. Her boyfriend, Patrick Cushing, also died in the crash. Gregory Reeves, regional vice president for Lifestyles, the company that runs the restaurant, recalled the young woman everyone called “Mandy” as low-key, with a “Mona Lisa smile.” Halse had worked at Shaker Pointe for the past three years, since the restaurant opened. He said he had spoken to Halse about pursuing a career in the restaurant industry; he believed she had what it took to succeed. Sister Kay Ryan, who also is part of Shaker Pointe’s leadership team, agreed with that assessment. Cushing, Halse’s boyfriend, graduated from eighth grade at St. Mary’s Institute in Amsterdam in 2001. 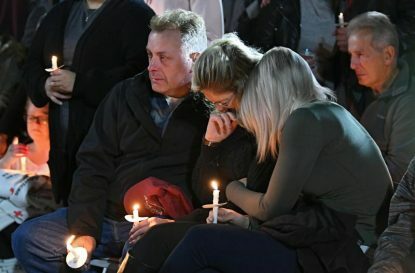 “He was a wonderful, quiet, shy kid,” recalled the school’s alumni relations director, Jeanette Constantine, who knew several of the victims and their families. Constantine noted that newlyweds Shane McGowan and Erin Vertucci McGowan, two more of the crash victims, also attended St. Mary’s Institute through seventh grade and second grade, respectively. 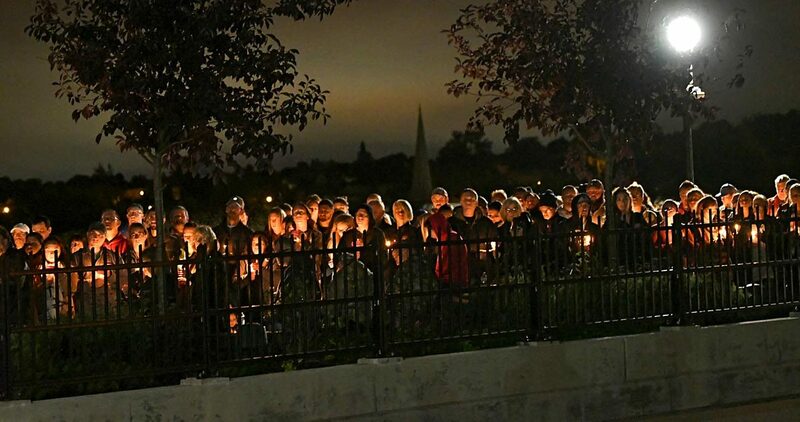 The school remembered the victims in morning prayers when the school reopened Oct. 9 after Columbus Day weekend. Constantine said they would also be mentioned in an upcoming liturgy. The McGowans married in June at St. Mary’s Church in Amsterdam. Mrs. McGowan also was Cushing’s cousin. One current pre-kindergarten student at St. Mary’s Institute lost an uncle in the accident. Another victim’s godchild attends the school. The intertwined connections are an indication of the closeness of the Amsterdam-area community. Two Catholics told The Evangelist that family members had been on school sports teams with several of the victims and were coached by others. Constantine said her nephew was a close friend of Cushing’s and had flown in from Chicago to attend a candlelight vigil held the evening of Oct. 8 at the Amsterdam pedestrian bridge. Maryknoll Father Jeffrey L’Arche, pastor of St. Mary’s Parish in Amsterdam, attended that vigil, which drew well over 1,000 people. He said the candles ran out before all the participants could take one. A funeral Mass was celebrated for eight of the victims Oct. 13 at St. Stanislaus Church in Amsterdam and for Cushing the same day at St. Mary’s Church, also in Amsterdam. The funeral Mass for the McGowans was being celebrated Oct. 15 also at St. Mary’s. Constantine said the hundreds of thousands of dollars already raised for children and other survivors through online GoFundMe pages, as well as the sheer number of memorials held for the victims, show the depth of the tragedy. The accident has been called the deadliest transportation accident in the United States since 2009. Blain is editor of The Evangelist, newspaper of the Diocese of Albany.